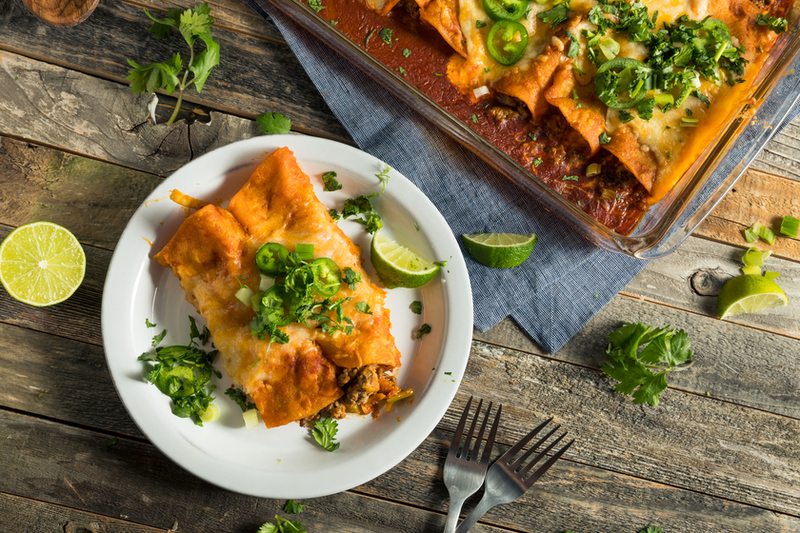 Enchiladas are a staple of Mexican cuisine. Their existence dates back to when the Mayans inhabited Mexico. They were the first civilization to roll meats in tortillas. Once they were introduced to the rest of the world, their popularity spread like wildfire. They now frequent dinner tables all across America and we’ve put our own unique twist on them for you to try! Start by giving the chicken some smoky love: Preheat your MAK on SMOKE mode, and once grill has warmed up, put the chicken on the grill. If the chicken has skin, just flip the skin to one side to allow the smoke to reach all surfaces of the meat. (Don’t remove it entirely– even if you don’t want to eat it, it will help keep the chicken moist during cooking). Smoke the chicken for 1-2 hours, then turn the grill up to 350. Place the skin back on the chicken if you moved it for smoking. Cook until internal temperature reaches at least 160°F. (This can be done the day before, and put in the refrigerator until you’re ready to assemble the meal). When you’re ready to cook the enchiladas: Preheat your MAK to 350°F. Shred or chop the chicken into bite-sized pieces and place in a bowl. In a large bowl, stir the sour cream and enchilada sauce together until well blended. In a 9 x 13 pan, pour a little sauce into the bottom of the pan to help keep the tortillas from sticking. Lay down a layer of the halved tortillas. Sprinkle a layer of shredded cheese, then a layer of shredded chicken. Pour about a cup of sauce over the chicken. Repeat this process until your pan is full, then top with a final layer of cheese. Bake on the MAK Grill until the cheese is melted all the way through the dish, about 30-45 minutes. These are great freezer meals, so why not double the batch while you’re at it, and have one for later?